Angela Dunnewald is merely existing, fading really, into a life that she is a background player in. Fortysomething, married to a high strung attorney who barely acknowledges her, best friends with a woman who makes her be a part of social groups she doesn’t fit in, Angela knows something needs to change but she doesn’t know how to change it. Until one day Daniel walks into her back yard. Daniel brings Angela to life and fills spaces she never realized were empty. Suddenly her world is turned upside down, and she’s striding a line she cannot balance on forever. This is the story of a woman who’s coming to the edge of something, but she can’t predict what it is. This book was a very quick read for me. In my opinion it was just OK–I don’t think the characters are ones that will stick with me for a long time. Angela is experiencing discontent with her life–as any person is allowed to do, no matter what their circumstances–but instead of reaching out to her husband, or her best friend, she turns in to herself for nearly 20 years before she connects with another person. And he’s a stranger at that. The way Daniel and Angela meet was a bit creepy and forced, to be honest. I just felt like the book was always moving towards a conclusion that never really came. There’s an end, sure, and Angela gets the shake up she needed, but the journey there was not that notable, to me. This is a quiet story, save for a few moments towards the end. There are no huge outbursts or drama filled revelations; each character seems to take things in a most stoic way. There are also storylines that in the end don’t seem to contribute much to the overall plot of the novel. I can’t say I truly disliked Vanishing Point, but there’s not one thing I can say I liked either. 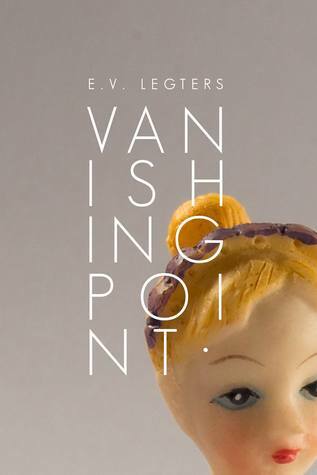 Vanishing Point is E.V. Legters’ second novel. Her first, Connected Underneath, published under her given name, Linda, instead of her chosen name, E.V., was released last year and is an INDIE Press Book of the Year finalist. Born in the far western reaches of New York State, and a long-time resident of Connecticut, E.V. is exploring new venues in which to finish her third. She is currently in Portugal. Posted on May 26, 2017, in book tour, books, reading, review. Bookmark the permalink. 1 Comment.